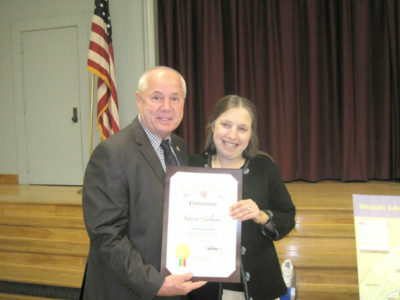 SOCIAL WORKER of the year, Karen Gilman was recognized by Councilman Tom LaBonge at the Larchmont Village Neighborhood Assoc. meeting in November. Larchmont Village resident Karen Gilman was named California’s 2012 Social Worker of the Year at a luncheon in October hosted by the National Association of Social Workers (NASW). “A lot of people express sympathy for those in need, but Karen springs into action,” said Jody Porter, who has worked with Gilman for the past 20 years on a variety of social justice projects. Gilman, who was named a 2010 Woman of Larchmont, in the Larchmont Chronicle, is best known for reaching out to the community and assisting both English and Spanish-speaking families who have children with developmental delays. As a social worker with the Exceptional Children’s Foundation (ECF), she works with parents of children with developmental disabilities and provides training to graduate students in social work and other mental health fields. In addition, she has worked on Shane’s Inspiration to help create handicapped-accessible playgrounds and facilitates parent support groups. Gilman also provides individual, group and legislative advocacy and training regarding special education, social security, MediCal, Aid to Families with Dependent Children and regional centers for the developmentally disabled.